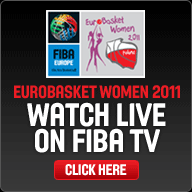 It is strange how Lithuania became a EuroBasket Women favourite after beating Russia and Turkey. Their defeat against the Slovak Republic was considered to be a bad day at the office. Their performance against Great Britain was nothing to write home about. Yet how they snatched the victory from the jaws of defeat is what day four in Bydgoszcz was all about. Great Britain had a 5-point lead with just over three minutes left to play (63-58) and appeared to be heading to victory. However all of a sudden their ball refused to drop while Lithuania picked themselves up. With 44 seconds left to play Egle Sulciute put her side ahead from the free-throw line (64-63). In an amazing scene of events both teams missed golden opportunities. But with 16 seconds left to play Sandra Linkeviciene from Lithuania had the chance to seal the game from the charity stripes. She missed both free throws and Julie Page (right) got the rebound. She then decided to dribble the ball up the court herself. Linkeviciene was following Page and hustled the ball off her close to the halfway line. Great Britain needed to foul a player to stop the clock. However most of them were at the other end of the court. So Lithuania had time to pass the ball around without being fouled. Hence Great Britain ended up losing on a turnover. 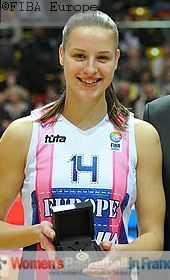 Page was Great Britain's best performer with 19 points, 7 rebounds and 3 assists while for Lithuania Ausra Bimbaite led the scoring with 16 points. Lithuania have qualified for the knock-out stage while Great Britain now require two victories to be sure of qualifying. Russia's poor ball handling skills is hitting them in this tournament as they are defeated for the second time. Belarus were leading (43-38) when Olga Arteshina from Russia was called for an unsportsmanlike foul with two minutes left in the quarter. Belarus took full advantage of the situation by hitting the free throws and then on the very next attack Katsiaryna Snytsina connected from the land of many for her side to go 10 points clear. Belarus kept their cool the rest of the way to win (62-51). They require one more victory to be sure of a place in the last 8. Katerina Elhotova (left) had a perfect shooting day to lead the Czech Republic to victory against Turkey (56-51) in a tight match. The Czech Republic join Lithuania in the bag for the quarter-final. The teams in Bydgoszcz have a day off from playing as the action returns to Katowice.